It was a perfect fishing night Paul, Marc, and I on Thursday - EXCEPT for the FLIES. We had small flies, big flies, horse flies, bees, wasps, and a few other varieties. Fortunately, the good fishing overshadowed the fly factor. We ended the night 4 for 8, 2 kings and 2 steelhead. The largest being a 15 lb king. 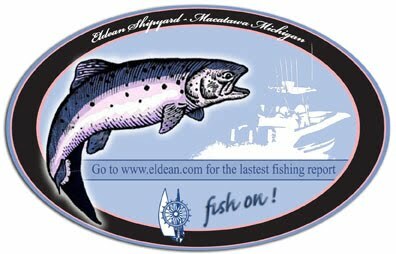 We lost 2 more steelhead behind the boat. Well, we actually lost 3 of them - let me explain: The first steelhead we had to put in the box and net twice. After putting it in the cooler, I turned my head for a second and it jumped out, right back into the water. Net in hand, I looked for it behind the platform and saw him about 2 feet down lingering and dove the net down and netted this one for a second time. The interesting and lucky detail was that this fish was fresh as it had hit a down rigger and was brought in pretty quickly. It was incredibly lucky he didn't swim away immediately after hitting the water. We took 2 hits on both Lead and Dipsies, and the Riggers were the hottest with 4 hits. A homespun, gold fly took two hits and a variety of spoons did the rest. We were straight out and a little north of the Channel in 90 to 110 FOW. The air shows that the Steelhead put on were amazing! After the lines were in, we took a quick swim. 68 degrees on the Surface. 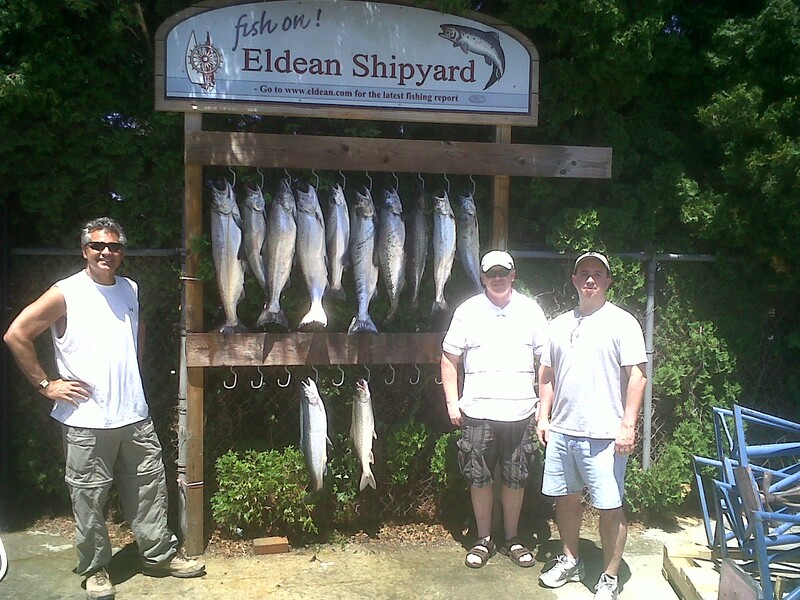 a few steelhead on the riggers and dipsey rods. Lake Trout. J D Charters is running from slip R-8 (next to the Piper restaurant) at Eldean Shipyard. I fished with Capt. Rich last night on the "Corner Office" (slip C-50) and also the Mike and the Boyz from C-10. We shot down to 100 FOW off Saugatuck and were fishing 4 down, 4 dipsys, and one lead line mostly in 100-120 FOW. It was a very slow start from 6-8pm and we ended up switching up the colors to try get something going. We put on White and white small ProKing that has been working well for me lately. This spoon was down 90 Feet and it then proceeded to get hit after hit, probably 5 in all. We ended the night with a weak 2 of 8, both kings and not very big. I missed a nice king at the net after the fish got tangle in the lead core and then got into a line on the rigger. It was flat on the water and there were only 3 other boats fishing Saugatuck. It was little strange to see so little fishing activity on the Lake on a calm, Saturday night. Jon, Marc, and I fished from 6-9pm yesterday. It had been the first time out for 2 weeks and there weren't any boats on the water that we could see, so we were guessing where to go and what to fish. We started in 90 and went as deep as 140, but we seemed to get the action in 100 to 120 FOW straight out from the channel. We ended the night 5 for 7 on fish and 0 for 1 on nets. The net went over the rail as the wind and waves picked up a bit; probably 2 - 5 foot waves last night. After the net went over, the real fun began. After a long fight Mark reeled the tired 15 lb King to the platform and I pulled it up and in by the leader and then wrestled into the cooler. I merely turned my head to request a needle nose, and the King open the cooler and jumped back out. Fortunately, I was able to wrangle the king in my hands before he slipped back in the water (I nearly slipped in the water myself, but Jon got a grip of my waistband as precaution - remember it was pretty wavy and rolly out there). 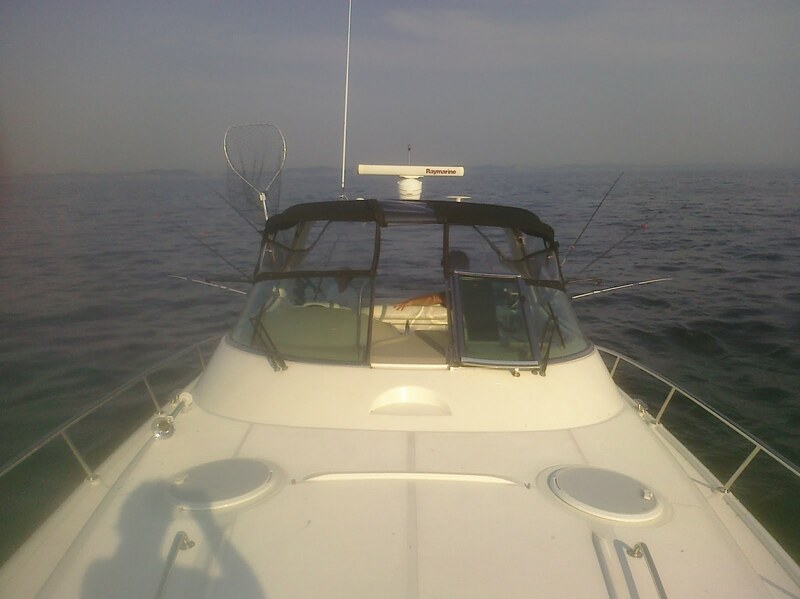 The next 15 lb king hit the port down rigger so hard, and the rod buried downward toward the bottom, then it swam right off the starboard side of the boat crossing lead, dypsy, and the other downrigger. We avoided a major mess, and there I was again, on the edge of the platform, trying to whisper (fish whisperer) this fish on the boat. First I tried to get a finger in the gill, but he shook me off, then, since it worked before, I grabbed the leader and hoisted. Unfortunately the leader or knot broke and this one swam away. Besides three, 15 lb kings, we also caught a 10 steelhead that ripped 300 feet of line off the dipsy, and also a small laker. One King and the Laker came on a dipsy set on 1.5, 160 back, with a homemade blue mirage fly. 2 kings and the steelhead came on downriggers, 70 to 90 down, on a spoon with blue. We had one hit on lead, but the 3 lead lines were silent most of the night. The water temp was 63 nearly top to bottom and there was a strong current. On Wednesday night, we did another Father-Son outing x 2. Ryan & I went out on the "Fishing Poles" with Capt. Jim and his son Brennan. We went out again to the 55 to 65 FOW. I heard that JD Charters had limited out on his afternoon charter in those waters. We stayed mostly south of the pierheads. It ended up being a slow night and we finished 3 for 4, all kings, with one big fish at 14 lbs. I heard from one of the other fisherman at the marina that his boat went North and was in 120 to 130 FOW and did better catching 9. It was a father and son trip last night. After Ryan & I saw the cooler of Steelhead that JD Charters brought in from his morning charter, we were really excited to get on the water. 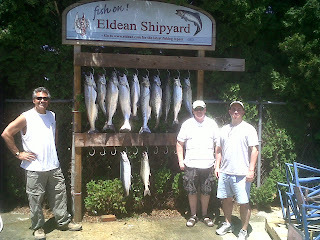 Capt Steve said to stay in close around 50 to 60 feet and tha small orange & red spoons was really working for Steelhead. So, at 6pm we set up in 55 FOW, with 2 downriggers and 4 leadlines. And sure enough, the first fish on was an 8 lb steely. We took another King, then Ryan had his work cut out with a 14 lb steelhead on leadline. The fish worked so hard that on its final leg it came in Laketrout style, mouth open, surfing the rest of the way. After that, it was mostly small kings. We ended the night at 9:30, going 7 for 9. We probably would have cracked the double digits, but we had 3 shakers that we dragged along for quite some time. A lemonberry magnum spoon took 4 of the fish, including the 2 steelhead. We didn't run any flies or dipsys. We didn't mark many fish all night, but they were there. Also, on the way in, the bait fish were jumping in Mac Bay.